From the crown cork with bullnose to the sparkling wine bottle with improperly wired agrafe, from the non-functional screw closure to the torn tamper evident seal on the lid of a jam jar, from the non-brand flip-off to the leaking crimp cap on the vial: the HEUFT FinalView II CAP takes the in-line identification of beverage, food and pharmaceutical containers with closure faults to a whole new level. Even the exact verification of the correct closure alignment is therefore no longer a problem. the top-down inspection with high-resolution colour camera technology finds deviating closure colours, designs and lid logos just as reliably as cracks in this area so that the unmistakable, homogeneous properties of the final goods are guaranteed just as the integrity and purity of the product. The walls of the closure must also be free of defects and leaks for this. Their all-around colour inspection with the HEUFT FinalView II CAP therefore covers far more than 360 degrees so that "blind spots" are finally no longer an issue: the smallest deformations, damage and leaks are identified just as reliably as defective tamper evident and support rings, torn safety seals and tamper evident strips, poorly assembled and incorrectly positioned agrafes or dented, possibly leaking crimp caps regardless of their actual position. The respective positioning is measured with millimetre accuracy and compared to the correct reference values in order to check the height of wine corks or the position of vial stoppers, detect protruding closure caps and tamper evident rings as well as identify completely misaligned, canted, potentially leaking container closures. The HEUFT reflexx² image processing system generates a shadow image for this in the HEUFT FinalView II CAP which shows the complete contour of the closure area in detail. The roll-on inspection of screw closures such as ROPP caps goes one step further: it checks the presence, continuity, characteristics and profile depth of the thread turns precisely so that only truly hermetically sealed containers can pass through which can be unscrewed by hand without any problems or risks. A proper alignment is often also important not just with regard to beverage packaging in the premium segment: each closure should be aligned at exactly the right angle to the label or to a special marking on the bottle neck so that the lid logo and inscription can be optimally seen and read directly without twisting and turning. 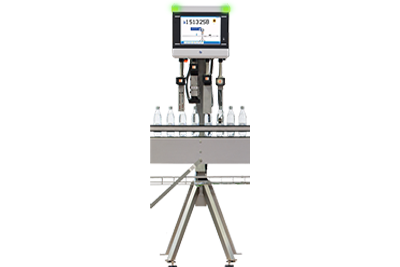 This is verified by the angle of rotation detection of the HEUFT FinalView II CAP – it compares the results of the above-mentioned top-down colour logo inspection with those of the closure wall inspection from the side for this. Even the smallest misalignments are thus reliably detected – containers with "twisted" lids no longer even reach the point of sale. 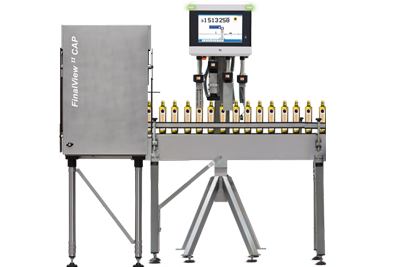 The HEUFT FinalView II CAP can also be easily integrated into existing filling and packaging lines: either as a stand-alone solution or connected to the HEUFT SPECTRUM II VX, the fill management system of the new generation, so that a precise fill level, label and marking check can take place, among other things, at the same time as the unrivalled detailed closure inspection. 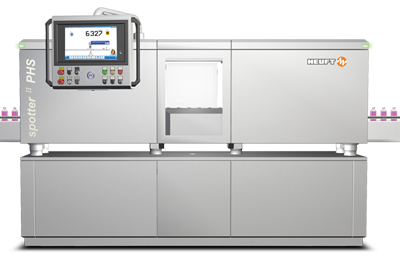 Or also as a compact module directly integrated in inspection devices such as the HEUFT squeezer II QS leakage check and the HEUFT spotter II PHS vial inspector. Compared to previous HEUFT solutions for an all-around inspection the HEUFT FinalView II CAP offers twice as many intelligent colour cameras, six times higher resolution, even more precise container tracking and fault rejection, considerably more computing power, real-time image processing and the audiovisual HEUFT NaVi user guidance. The maximum diameter of closures to be inspected completely has increased by a factor of 1.5. The possible height difference between the smallest and the largest full container which can be reliably inspected has climbed to 30 centimetres. Brand and format changes can be carried out at the touch of a button. 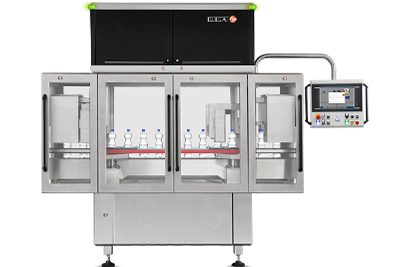 The new generation of closure inspection thus ensures the originality and integrity of the packaging as well as the purity, freshness and safe consumption of its contents simply, effectively and sustainably.